HostGator.com is a world leading provider of shared, reseller, VPS and dedicated web hosting. The over eight million domains hosted by HostGator make up approximately 1% of the world’s Internet traffic. We are pleased to announce that we do have 25% off entire order and 1 month free WordPress hosting coupon. 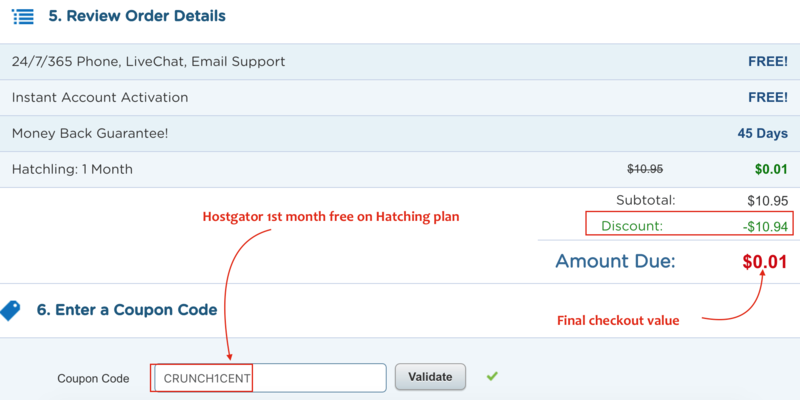 We recommend you use this discount on Hatchling, Baby, and Business hosting plans. If you use this coupon code with the Baby Hostgator plan you will subtract $9.94 off first month which means first month = 1 penny! Choose your plan and proceed to checkout. Provide coupon code CRUNCH25OFF to get 25% off on entire purchase. OR choose Hatching plan for 1 month. Apply code CRUNCH1CENT to get 1st month free.